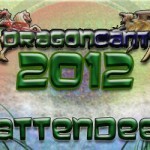 While some of you are getting ready for Dragon Con, many of us are not able to attend. But never fear, because there’s Dragon*Cant, an online con for those of us who can’t make it to Atlanta, but still want to be a part of the con experience. And Zeus, Inc., will be available as part of the Dragon Cant Merchants Circle.